Will I give Qatar's Sheikha Mozah a Gold Star every time she makes a major state visit? Probably. Some things are just inevitable. I mean, would you look at this? Glam. There's no better word for it, from the jacket oh-so-casually draped over her shoulders on her arrival in Spain, right through the elegant lines on her white and black number while departing. She even made the glam list while wearing trousers (trousers! A Mozah first for me!) at a private dinner with the King and Queen. Delicious. 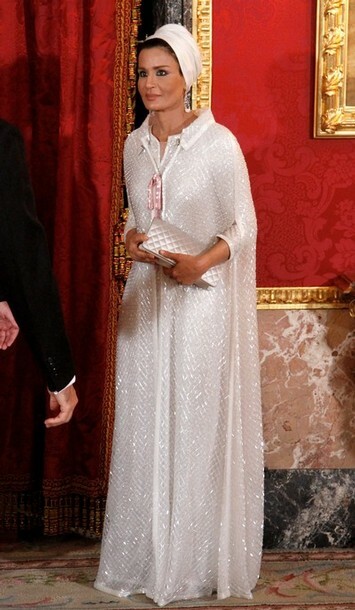 Per usual, the Sheikha is 100% couture. Taking see-through Chanel and making it modesty-appropriate? Now, that's elegance. Wouldn't you just kill to be a fly on the wall at a Karl Lagerfeld/Sheikha Mozah tête-à-tête? I think I'd explode from all the fabulous. The Sheikha even withstands challenges to her chicness with style. After losing her shoe (another one for the wardrobe mishaps collection! ), she recovers with a chuckle on the arm of Queen Sofia. Gold star, awarded for being fabulous right to the end.